Hot on the heels of We Steal Secrets: The Story Of WikiLeaks, acclaimed documentary filmmaker and interrogator Alex Gibney returns with The Armstrong Lie. This time, he turns his attention to Lance Armstrong, the seven-time Tour De France-winning cyclist who somehow extraordinarily managed to hide his dependency on performance-enhancing drugs in plain sight for over ten years, for a documentary that’s both fascinating and repetitive. Originally conceived as a film to celebrate the impressive career of Armstrong, Gibney was forced to put his documentary on hold and change tactics when the hardly unsurprising revelations came to light in the midst of Armstrong’s comeback in 2009. 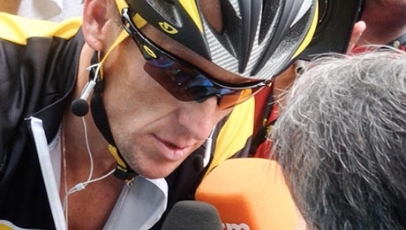 With an interview with the disgraced man himself at his centre, The Armstrong Lie flits back and forth, filling in the gaps of the former athlete’s whirlwind career. The film is arguably at its most successful when focused on Armstrong’s 2009 comeback race, and his subsequent refusal to feel any form of guilt not only for his dishonesty, but also for the fact that the miracle man image that was carved for him through his wins and inspiring promotional deals, most of which related to his dealings with cancer, were steeped in lies from the very start. He’s a beguiling figure to observe, and Gibney tries his very hardest not to be bias in his representations, though he can’t help but be angry for the fact that even he, someone who’s naturally suspicious, allowed himself to be duped by Armstrong’s continual denials and his quite remarkable undeterred momentum. The fact that Armstrong remains shady, even after the film draws to a close, says all it needs to say about his character. Apart from Gibney’s desire to crack the uncrackable, and the interesting facts that emerge surrounding Armstrong’s use of performance-enhancing drugs – from testosterone to EPO) – and how he was able to conceal it so well in spite of all those who had already turned against him, The Armstrong Lie can’t help but feel repetitive – in that it’s stuck on repeat, skipping through far from illuminating confessionals and archival footage for the remainder of its overlong run time.